Stay tuned for all the latest developments as thousands of people protested in towns across Serbia against what they call the “dictatorship” of Aleksandar Vucic, the president-elect and current prime minister. 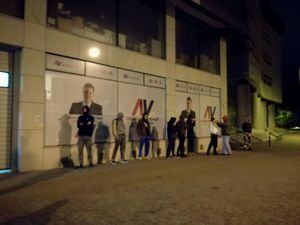 Anti-government protests in Novi Sad, the biggest so far, saw the demonstrators blocking the street toward the building of Vojvodina’s provincial broadcaster, RTV, and guarding local office of ruling Progressives. Protesters, who demand both RTV management and Progressive led government to resign, said they did not want to risk any incidents or sign of violence to occur during the protests. 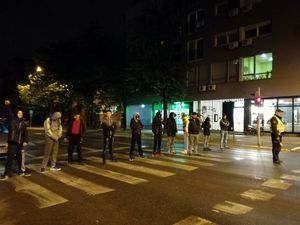 Hundreds of people took the streets of central Serbian town of Kragujevac earlier tonight to protests against the government led by Prime Minister Aleksandar Vucic. Anti-government protests were once again held tonight in Sombor, Kragujevac, Kraljevo and Krusevac, where hundreds took streets. 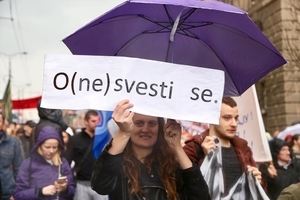 Larger protests with thousands participating were also held in Nis and Novi sad, while the one in Belgrade is still ongoing. Thousands anti-government protesters in Belgrade are walking back to the parliament building where the protest would soon end chanting “Arrest Vucic!” “Vucic Thief!”, "Down with Dictatorship!" and “Tomorrow at 12pm!”, announcing a big rally in the capital tomorrow. Anti-government protesters from all over Serbia are expected to join a rally in Belgrade tomorrow, where police and army union will be protesting at noon. 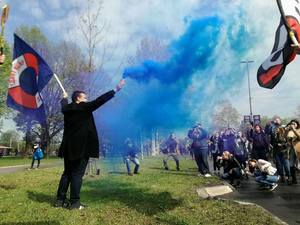 As protesters from around Serbia are gathering for anti-government rally in Belgrade, Sloga trade union announced it will join youth protests in Serbian capital on Tuesday. 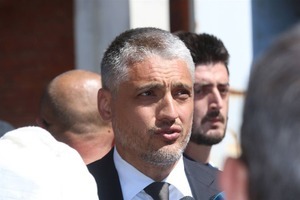 The union demand resignation of a director of Krusevac based rubber goods factory Trayal, after the factory dismissed the head if Trayal union head, Vladica Tomasevic. According to the union Tomasevic was sacked because he was inviting workers to join youth protesters. The factory however said Tomasevic was considered to be redundant. Youth protesters that have been rallying against the “dictatorship”, as the demonstrators refer to the rule of Serbian Prime Minister and President-Elect Aleksandar Vucic, are joining a protest scheduled by army and police unions for today at noon in Belgrade. Army unions supported youth protests’ demands that are calling for the government to resign along with top officials from the public broadcasters RTS and RTV, the Central Electoral Commission, RIK, and the regulatory Authority for Electronic Media, REM. They also demand the resignation of Maja Gojkovic, the speaker of parliament, who they claim broke the law when she prorogued parliament ahead of the presidential vote. Several thousands people gathered in front of government building in Belgrade. Traffic is stopped and there are no police forces around the rally. Protesters are still gathering. 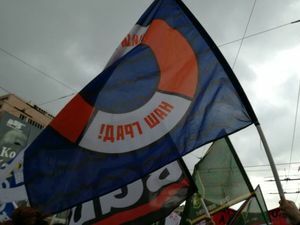 Rally in Belgrade, organised by army and police union who seeks higher wages and better working conditions, also gathered the activists from “Let’s not Drown Belgrade” initiative that have been protesting against grand state-backed construction project Belgrade Waterfront. 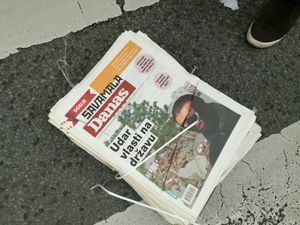 Protesters in Belgrade are sharing a last year’s copy of daily newspaper Danas, one of the rare independent dailies in the country. Danas said they lost many advertisers in the course of the last 12 months and thanked its readers for the support that flooded social media in the last few days. “We are not under the influence of any political party, politician or organisation…and we are trying to keep it that way,” Stambolic, a grandson of former Serbian President Ivan Stambolic murdered in 2000 on the order of late Serbian strongman Slobodan Milosevic. Informer is infamous for its biased, defamatory articles and often reports on alleged coups. Opposition Liberal Democratic Party, LDP, said their representative would resign from the Central Electoral Commission, RIK, on Monday. Cedomir Jovanovic, the head of LDP, said that the decision of resignation came as a response on youth protests, who have been rallying across Serbia demanding among other things resignations of RIK members. “The times when politicians would turn the army and police against its people are over. Army, police and the people are in one place today,” Veljko Mijailovic, the head of police union told the protests. 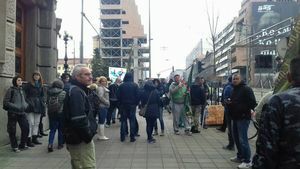 He said that Nebojsa Stefanovic, Serbian interior minister, ordered all its employees to show up for work today so that they could not come to the protests. As the people chanted “Tyrant” and “Betrayal”, Mijailovic said that security in the country is crumbling, while the ministry is employ people with criminal records. Novica Antic, the head of army union, said that army members were libeled as “traitors” and “foreign mercenaries”. Antic said that “some do not deserve to be high commanders” alluding the President-Elect Aleksandar Vucic. 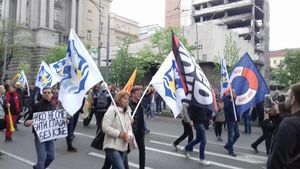 The unions that are protesting against government have played the rally an old recording of Serbian Prime Minister Aleksandar Vucic saying that he will not cut pensions. The pension cuts were introduced in Serbia in 2014. Thousands anti-government demonstrators are staring a protest march towards the Presidency building chanting “Vucic, Thief!” and blowing whistles. Local media estimate that around 20,000 people are protesting against Aleksandar Vucic’s government in Belgrade. The rally brought together army, police unions and workers unions, students, pensioners and other citizens. 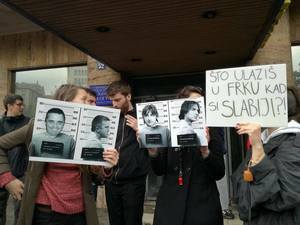 Protesters are holding ‘wanted’ posters of Maja Gojkovic, Serbian parliamentary speaker, Dragan Vucicevic, the editor of pro-government tabloid Informer, and Zeljko Mitrovic, owner of pro-government TV Pink. Informer and Pink have both been marking protests as 'dangerous'. Both are infamous for its biased, pro-government reporting and public persecution of government's critics. More then a dozen thousands anti-government protesters in Belgrade are marching toward the Palace of Serbia, the seat of interior ministry and a future seat of the presidency. Aleksandar Vucic, current Prime Minister and President-Elect, said earlier that the seat of the presidency, once he becomes the head of state, would be at the Palace of Serbia. 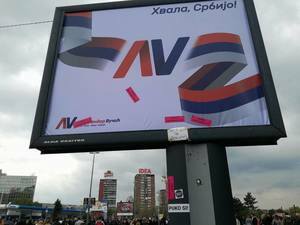 Protesters at the Belgrade rally against Aleksandar Vucic's government have reached Branko's Bridge and are crossing into New Belgrade, where the Palace of Serbia is situated. Some estimate that there are 20,000 people in the column, heading for the seat of the Ministry of Interior. The rally is proceeding without incident. Protesters are filling the plateau in front of the Palace of Serbia, an administrative building in Belgrade that Aleksandar Vucic intends to make his seat upon assuming office as Serbia's president. The building used to be the seat of socialist Yugoslavia's government, and housed the cabinet of its president Josip Broz Tito. 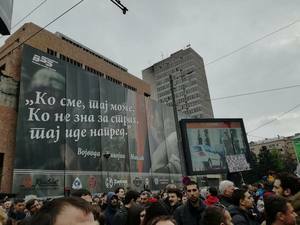 Anti-government protester lights a torch next to the billboard of Serbian Prime Minister and President-Elect Aleksandar Vucic. Serbian Prime Minister and president-elect Aleksandar Vucic said today that the National Assembly shall be resuming its session soon, Beta news agency reports. The session was controversially discontinued because of presidential elections, but after the anti-Vucic protests broke out six days ago the Speaker, Maja Gojkovic, accused the protesters of preventing the parliament from operating normally. Dozens of Serbs organised a support anti-Vucic rally in Vienna carrying banners “Brain drain” and “Support for Serbian people in North Korea”. 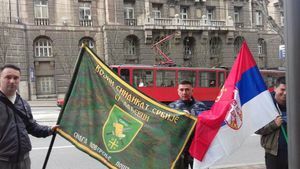 The rally of police and army unions has finished, and the column of protesters is heading back to the National Assembly, where students have been protesting for the past six days against the rule of Aleksandar Vucic. The unions have pledged to join the youth in front of the parliament. Bojan Pajtic, former leader of opposition Democratic Party, DS, said he resigned as a deputy in Serbian parliament in a response to ongoing youth protests against the rule of Serbian Prime Minister and President-Elect Aleksandar Vucic. About 1,000 people protested in Serbian southern town of Nis against – as they say – “dictatorship of Serbian Prime Minister and President-Elect Aleksandar Vucic. Today was seventh protests in a row in Nis and the fresh rally is scheduled to be held tomorrow at 6pm. Fresh rallies are expected to be held tonight after 6pm in Belgrade, Novi Sad, Krusevac, Sombor and several other towns across the country. 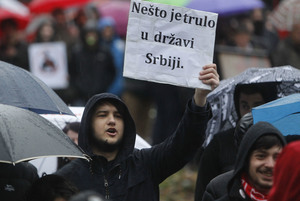 Anti-government protests are starting in Belgrade, Novi Sad, Krusevac, Sombor and several other towns across Serbia. People are starting their protest against the Serbian government in Belgrade in front the National Assembly, from where they will continue to the building of the national broadcaster Radio-Television Serbia, RTS. From there they will continue towards the building of the Serbian government and return to the National Assembly. 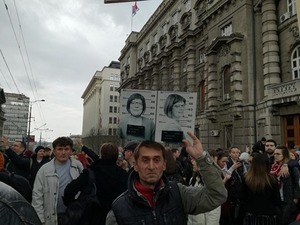 Anti-government protesters are carrying signs "People Starves, Elite Rejoices", "We Won't Be A Cheap Labour Force", while pensioners hold a sign "Children, Pensioners Are With You". People are still gathering in front of the National Assembly for the anti-government protest in Belgrade. 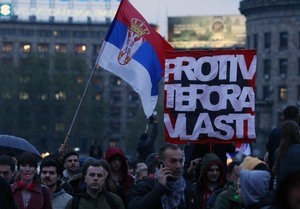 There are around 1,000 of protesters against Serbian government in Belgrade, moving towards the main Square of the Republic. Many thousands of protesters against government gathered in northern Serbian city of Novi Sad, thus being the biggest in that city this week, regional N1 reports. Protesters are moving towards the Radio-Television Vojvodina, RTV. Protesters carry signs "Against the System", "Against Capitalism By All Means", "Stop Vucic" and "Let's Save Chinese Neighbourhood". 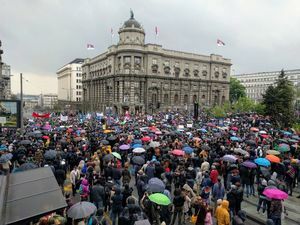 Several thousand of anti-government protesters passed the main Belgrade Square of the Republic, passed the Radio-Television Serbia, RTS headquarters and are moving towards the building of the Serbian government. A column of anti-government protesters in the northern Serbian city of Novi Sad have came to the building of the regional government, shouting "We Won't Stop". Protesters announced the new protest on Monday at 6 pm. Anti-government protesters lighted torches in front of the government building in Belgrade. Now protesters are moving back to the National Assembly. 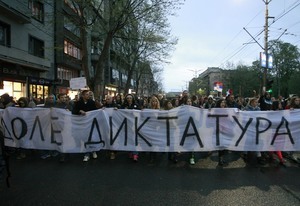 Anti-government protest in Belgrade has ended in front of the National Assembly. Protest went by without any incidents. Protesters announced the new one for Monday, 8th day in the row after the presidential elections on April 2. Serbian Prime Minister and President-elect Aleksandar Vucic denied today that he will be staging a counter-protest of his supporters on Thursday as a response to the wave of anti-government rallies across Serbia that were triggered by his victory in the April 2 presidential elections. "That day is Maundy Thursday [the Christian holy day falling on the Thursday before Easter], and besides, I have no need to bring out 50,000-100,000 people… I see no point in doing that at the moment. 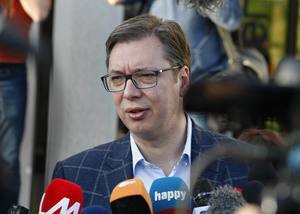 This information is incorrect," Vucic said after meeting US Senator John McCain in Belgrade on Monday.